Whoa now, Craftsman and Wolves, you're comin' in hot. Here's what I like about you - you're a little arrogant. How so? I mean c'mon, the dapper baker at the helm, William Werner, sells fancy-shmancy lookin', bougie-sounding sweets and savories (i.e. a haute dog, with beet chips), displayed with enough space between each item to make you think you're shopping for designer goods. Well, I guess in the world of pastry, the fare that's served at Craftsman and Wolves is as designer as it gets - both in the display, and in taste. Let's start with the gougère. 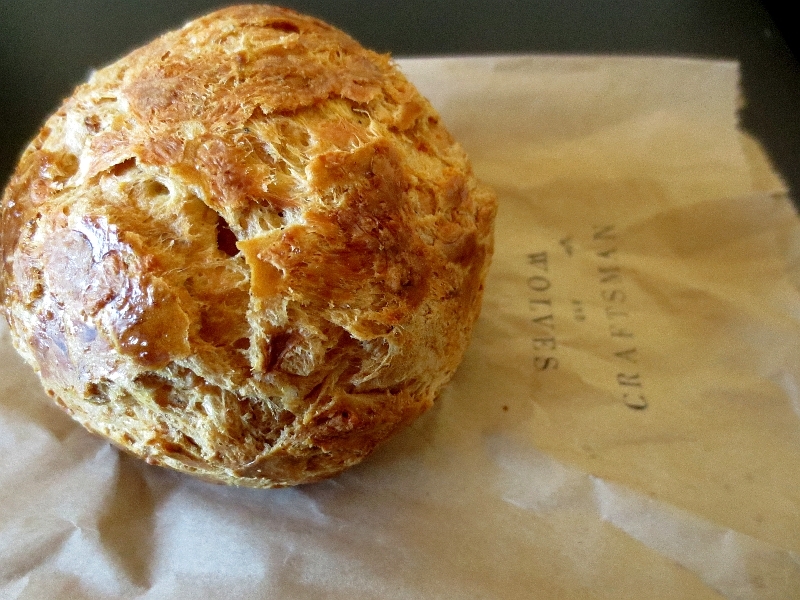 First off, when was the last time you ate a memorable gougère? Oh never? Except, maybe that one time in Paris? That's what I thought. 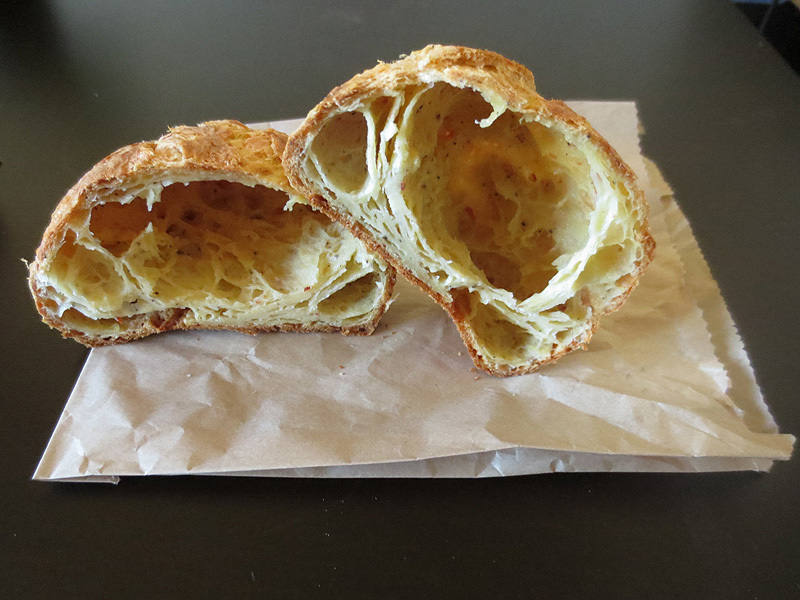 I was certainly surprised that they have a smoked cheddar and hot pepper gougère that I'd probably go back for daily without any hesitation. Actually, there's no "probably" about it; I might have popped in for that thing 2 days in a row...on my way back from the gym (I know, I know!). To put it simply, they have a gougère that I'm even WRITING about for god's sake! Enough said. Moving onto the Cuban Pop Tart. Hunks of delicious ham, mortadella, crunchy pickles, with country mustard, baked within a pop-tart-esque pastry crust. Let's be real - it looks dry. Unlike the moist, silky taste of a real (microwaved) pop tart, at first glance the pastry dough crust of this Cuban pop tart looks a little too brown and thick. But don't judge a book by its cover because guess what, Mr. Werner definitely knows what he's doing. That thing is stuffed with enough saucy, salty, meaty-moist filling so that you don't need to have a liter of water on hand in order get it down. What I'm trying to say is, it's good. Real good. Now let's talk sweets. Have you ever met a designer cake? Well, my friend, let me introduce you to the Cube Cake, Craftsman and Wolves' signature dessert that epitomizes their "modern french" take on pastry. 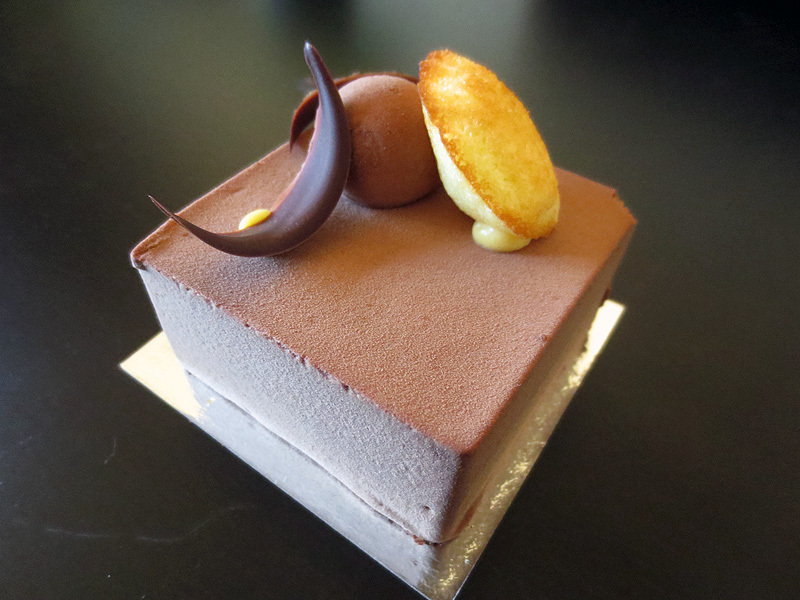 This is the Yves Saint Laurent of the cake world: elegantly minimalistic, visually striking, and luxurious (in flavor). I think that most people see the rows of these cubes behind a large display case and think "designer" or "to beautiful or fancy for an afternoon snack." But, I have a bone to pick. I don't understand why most of the articles that mention these cakes describe them as being fit, primarily, for special occasions. No, NO! On the contrary, they're individually portioned, served "pret-a-porter," at a price that honestly baffles me, given the quality. I mean, only $8 for a "mini" cube cake that is both filling and tastes of ambrosia? That seems like a good deal to me. All I'm saying is that I think that the flavors change with the season for a reason; they're not just fit for special occasions, they're also fit for being forked into my mouth on a weekly basis. Currently, they have two on the menu: the first made with Gravenstein apple, butterscotch, and vanilla; the second is comprised of "dark chocolate, passion fruit, and caramel" which actually means it's made of Taïnori dark chocolate (a type of from Valrhona), crispy dentelle (puffed rice), passion fruit cream, caramel, with a Madeleine on top. On my last excursion, I decided to go with the latter and was blown away. The chocolate ganache was so light that it almost had an angelic quality to it; the subtle change in texture as you move towards the center layers of gooey caramel and crispy puffs of rice, sorry dentelle, speaks to the skill behind stove. Just when you think it can't get any better BOOM! You get that surprising, tangy pop of creamy passion fruit. Simply, this dessert is master class. Do yourself a favor and don't wait for a special occasion. Go try that cake...and that gougère...and everything else that's on display as soon as possible. Craftsman and Wolves are the best! Have you tried the chicken and waffle at The Front Porch? It's so good. You should check it out when you have the chance!